Let's face it the reserveratrol products out here online are a dime a dozen. I've gone to great lengths to research online and reference many articles about resveratrol and it's anti-aging properity's. 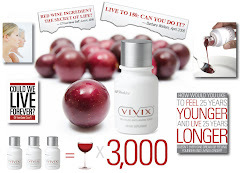 Below I've placed a link to an excellent webinar recording of a former cancer researcher Jim Burke explaining the history behind our anti-aging product called "Vivix". This is a information packed 30 minute sure to give you the information you are seeking.